This compact Boost & EQ device is based around the tone-shaping options available in old audiophile-grade stereo preamps, making it a great addition to your pedalboard, no matter what instrument you play. So what does that mean, exactly? It means that you’ll hear full frequency response from your Tone Job everywhere you plug it in – guitar, bass, drum machine, synthesizers, steel drums, harpsichord, kazoo, car stereo, or wherever! 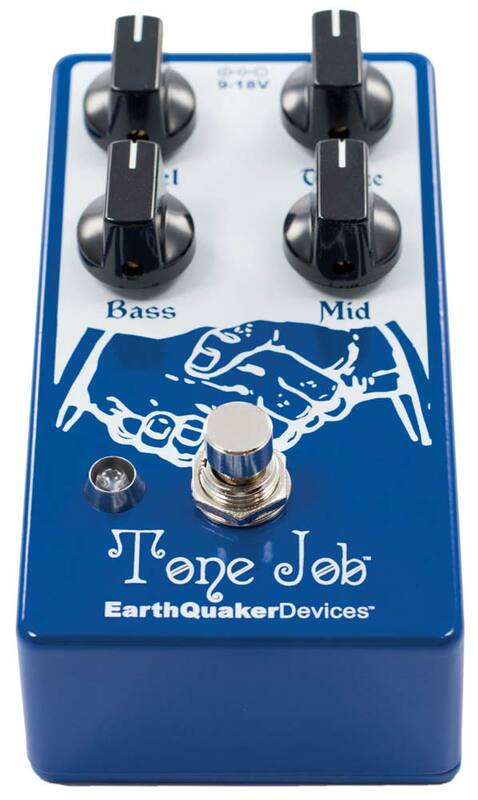 The Tone Job has active EQ controls for Bass, Mid and Treble, with up to 20 dB of cut or boost, which is handy for pairing up with other pedals in your chain to breathe new life into old dirt. Unlike boring old graphic EQs, the Tone Job’s EQ controls are interactive, so you can experiment with different settings to alter the response and overall feel of the device, getting your tone out of the lunchroom and back on the clock. 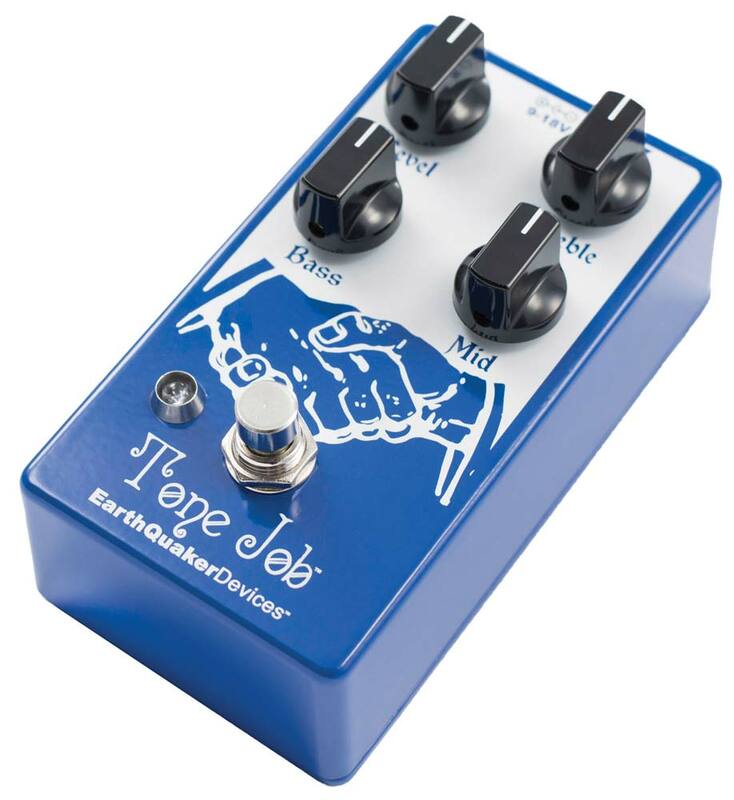 Place the Tone Job at the beginning of your chain to alter the overall character of your guitar, or use it at the end to boost output at the end of a long cable run and fine-tune your tone. The Level control on the Tone Job can boost your signal up to 5x the original input level, so you’ll always be heard, and makes for a fantastic solo and/or clean boost! 1. Level: Post EQ volume control. Can boost the signal up to 5x the input. Unity is around 10 o’clock. 2. Treble: The center position is flat and marked with a center detent in the potentiometer. All settings above this point boost the treble and all settings below cut treble. 3. Bass: The center position is flat and marked with a center detent in the potentiometer. All settings above this point boost the bass and all settings below cut treble. 4. Middle: The center position is flat and marked with a center detent in the potentiometer. All settings above this point boost the middle and all settings below cut treble. Treble affects frequencies from around 2k Hz up, Bass affects frequencies from around 500 Hz down. The Middle is an adjustable resonant filter acting as a midrange control with its center frequency around 1k Hz. Treble and bass response are dependent on Middle control settings. Bring your intro riffs to the front of the mix. Boosting volume while shelving certain frequencies to keep the musical moment focused and clean. Keep moving bass lines free from too much string noise while keeping clarity and bottom end right where the music needs it. Shelve unwanted high frequency without losing articulation or clarity. This device takes a standard 9-18 volt DC power supply with a 2.1mm negative center barrel. We always recommend pedal-specific, transformer-isolated wall-wart power supplies or multiple isolated-output supplies. Pedals will make extra noise if there is ripple or unclean power. Switching-type power supplies, daisy chains and non-pedal specific power supplies do not filter dirty power as well and let through unwanted noise. DO NOT RUN AT HIGHER VOLTAGES!